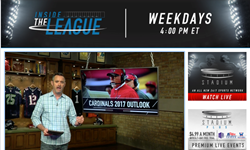 Live now on WatchStadium.com, Twitter and Pluto TV, with additional platforms launching soon. Stadium -- the new, first-of-its-kind, 24/7, multiplatform sports network -- is now officially live and available for free on WatchStadium.com,Twitter (@WatchStadium) and PlutoTV. The network will run 24 hours a day, seamlessly integrating and moving among first class live and on-demand games and events, extensive highlights, classic games, original programming and daily live studio programming. Stadium’s three signature studio shows, Inside the League, Campus Insiders and The Rally, live at 4:00 p.m., 4:30 p.m., 6 p.m., 11 p.m. and 1 a.m. Monday-Friday. Conference USA college football doubleheader on 9/2: Alabama A&M takes on UAB, as the Blazers make their historic return following the elimination of the program, followed by Major Applewhite's debut as Houston's coach as they take on UTSA. One-hour college football kickoff special previewing the upcoming season and featuring insiders from campuses across the country. One-hour Floyd Mayweather / Conor McGregor special featuring guest interviews, including undisputed light welterweight champion Terence Crawford, and hosted by Stadium’s own MMA expert, Dave Ross. Several live Patriot League women's and men’s soccer games and women’s volleyball matches. Full game replays of the best performances from this season's potential Heisman candidates, Baker Mayfield, Lamar Jackson and JT Barrett. "We stand alone in our ability and enthusiasm for taking the concept of a television style 24/7 network into a new digital marketplace and aligning our distribution with current fan behaviors and next generation platforms,” said Stadium CEO Jason Coyle. Viewers can access the 24/7 digital feed nationally via WatchStadium.com, Twitter (@WatchStadium), the Twitter app on connected devices and the leading OTT platform, Pluto TV, on Channel 207. Stadium iOS and Android apps, as well as additional connected devices and distribution partners, will be released in the coming weeks. In addition to the several hundred live games found on the linear network, WatchStadium.com also gives fans access to an additional 2,500+ college games, including exclusive football, men’s and women’s basketball, lacrosse, and volleyball events from conferences such as the Mountain West, West Coast Conference, Patriot League, Conference USA and Southern Conference, all available live and on-demand. Additional on-demand content includes highlights, quick-hits, in-depth analysis and original long and short-form programming. "Watching your favorite team at home with friends and family is probably the next best thing to watching it in person," said Tom Ryan, CEO of Pluto TV. "We're excited to bring all of Stadium's live sporting events to Pluto TV viewers in high definition, streaming for free to connected TV devices nationwide." In the coming weeks, Stadium Plus programming will also be introduced. Stadium Plus includes over 500 exclusive live games, classic events, and commercial-free Stadium TV re-airs and VOD content for a monthly fee of $4.99. The over-the-air launch of the 24/7 network is slated for next month. More details on the OTA availability will be announced shortly. Stadium is a new multi-platform sports network featuring exclusive live and on-demand games and events, extensive highlights, classic games, original programming, and daily live studio programming. Stadium was formed when Campus Insiders, 120 Sports and The American Sports Network merged into a singular network to take advantage of a combined collection of professional and collegiate rights and unique access to both digital and television distribution opportunities. Stadium includes a 24/7 linear feed distributed across both digital and broadcast platforms, as well as a comprehensive array of on-demand (VOD) digital content including additional live games and events. Stadium is owned by a collection of industry leaders including Silver Chalice, Sinclair Broadcast Group, MLBAM, the NHL, the PGA TOUR, and Time, Inc. To learn more, visit: http://watchstadium.com/. Pluto TV, the leading free OTT television service in America, carries and programs more than 100 channels in partnership with major TV networks, movie studios, publishers, and digital media companies. It also recently launched its free Video on Demand offering. Millions of viewers tune in each month to watch premium news, TV shows, movies, sports, live events, cartoons, and trending digital series. Download the Pluto TV app free on mobile, web, and living room devices, including Roku, Apple TV, Android TV, Playstation, Xbox, and more. Headquartered in Los Angeles, with offices in Berlin, New York City, and Silicon Valley, Pluto TV is backed by USVP, ProSiebenSat.1 Media, Scripps Networks Interactive, Sky, United Talent Agency, Luminari Capital, Chicago Ventures, Pritzker Group and other prominent investors.